Ly Phan pitched a management system for nail salons in the form of an app, benefits nail technicians, salon owners, and customers. Ly Phan, a Business Administration major from Vietnam, took first place in the annual Big Idea! Pitch Competition hosted by the Center for Innovation, Entrepreneurship & Franchising on Oct. 9. 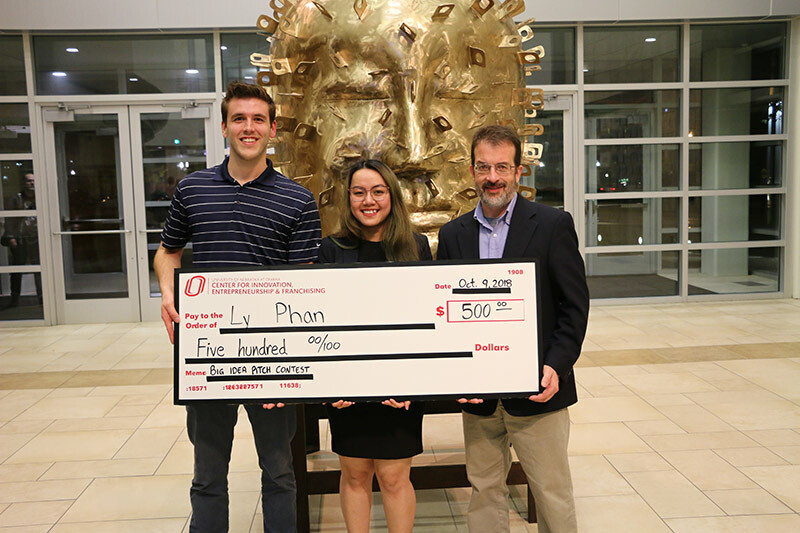 For first place, Phan received a $500 check and an all-expense paid trip to the National Collegiate Entrepreneurs Organization (CEO) Pitch Competition in Kansas City. At CEO Nationals, she placed in the top 16 out of 80 other competitors. Her business concept is "NailedIt", a management system for nail salons in the form of an app, benefits nail technicians, salon owners, and customers. It would increase efficiency of communication between salon owners and nail technicians while allowing customers and technicians to build rapport. Additionally, it would allow customers to see ratings and performance reviews of salons and technicians, allowing for a seamless experience from all angles.